The main theme of this post seems to be about making the most of fresh produce, both home grown and store bought. I have been revelling in the vast range of great fruit and vege available at the moment, and am so spoiled for choice it is almost getting the better of me as I try to decide what to do with it all! 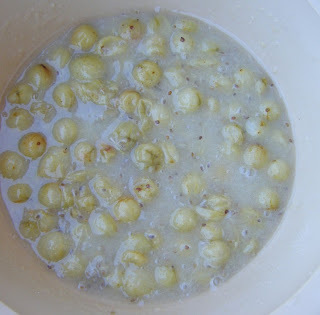 What kicked me off was receiving a large container of gooseberries from my mother's friend Pam. Both Mum and Pam are keen (and great) cooks and gardeners. I love this of course as I am often a recipient of gorgeous fruit or vege that is too plentiful for them to eat themselves. Rhubarb is a common one that I spirit from them, plus various types of lettuce, beans, cherry tomatoes and herbs from my mother and citrus fruit from Pam, including her lovely limes! They are a lifesaver at times, knowing that if I can't get one of those things (or have forgotten to get them is more like!) at the supermarket, I can pop around and do a raid! I used to have 2 lovely raised vege gardens before we extended our house and they got swallowed up in the name of more floor space, fortunately we were able to uplift them and rehouse them in my mothers back yard and they continue to bear fruit so to speak! I so miss having veges in my back garden, I have never quite gotten the momentum up again to start a garden somewhere else in my backyard. As our plans are to move in the next year or so it doesn't look likely either! So I am grateful for being able to enjoy the fruits of my mother's labour! I have never cooked gooseberries before. I absolutely love them but realised as I was looking for recipes to do something with them that all my experiences were of my mothers cooking of them, usually in a lovely buttery shortcake. I decided this was my best bet too, as the other option, a gooseberry and elderflower fool required me hunting down the elderflower cordial, which I knew was going to be mission impossible around here! The gooseberries are a bit of a pain in that you have to top and tail them, got a bit boring I must say. This is when the lazy cook that I am shines through, I am really not one for lots of prep with fruit and vege! I also wasn't sure whether to cook them first or put them in uncooked. I decided to cook them, I added a couple of tablespoons of sugar and even though I added no water they were decidedly runny. I decided to thicken it with cornflour and let it well and truly cool down before I popped it into the pie. 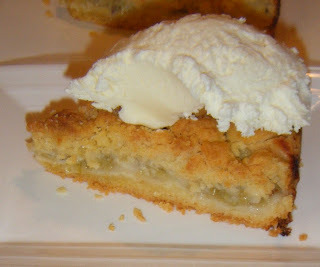 I used an absolute favourite recipe of mine from Allyson Gofton, which is a shortcakey kind of krummeltorte. It was one of her very first "Food in a Minute" recipes and I have thrashed it ever since as it can all be done in the food processor and is so little effort for such excellent reward! 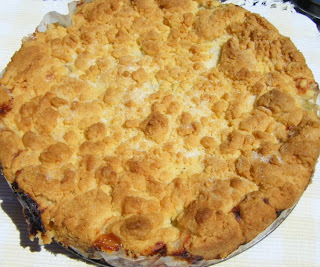 I now use self raising flour instead of the flour and BP and I use it as a base for any fruit, as I always have tinned apple (which is more lacking in flavour I concede, but is a good standby) and frozen berries, these are the usual culprits. I love it - if someone drops in I can throw it together in no time flat, bung it in the oven and have something lovely to serve with coffee. 1. In a bowl or food processor beat together the butter, castor sugar, egg, vanilla essence and orange rind until creamy and well mixed. 2. Add the flour and baking powder and stir or pulse to mix well. 3. Spread 2/3rds into the base of a well greased and floured 23cm loose bottom cake tin. 4. Spread over the apple or other fruit. 5. With floured hands dot the remaining dough over the top. 6. Bake at 190oC for 40 minutes. I have also been making pesto after seeing the prolific amount of basil my sister's green house was producing I arbitrarily decided she did not need it all and I would take a huge bag home. This was served just tossed through spaghetti, one of my favourite summer meals! 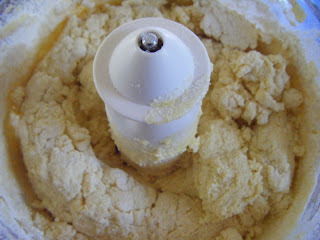 My food processor is really getting a work out at the moment! I visited the nearby farmers market for the first time today, it is in its infancy and still rather small, with the selection quite limited. I did manage to pick up some lovely organic potatoes, the purple skinned variety, some broad beans and a luscious looking rockmelon. I had a dish in mind for the potatoes and broad beans, but wasn't sure whether the rockmelon would last until the evening to do anything with! 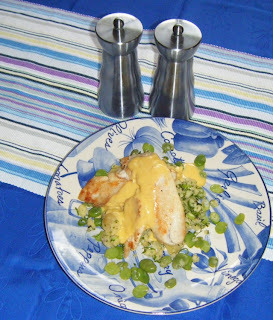 After a couple of rave reviews I wanted to make Pi's (from Violet's Pantry) crushed potatoes to go with panfried fish, broadbeans and hollandaise (from the October 2007 Taste mag). Again the scraping of those lovely little potatoes was arduous but I suppose worth it, they are so waxy and creamy and lovely! For the crush you just flatten them with a fork, pop on some butter and a handful of chopped spring onions, plus I added a mix of fresh herbs (basil, parsley, chives and mint). It was really nice and worked well with the rest of the dish. The hollandaise recipe was a departure from my usual version in that I didnt have a lemon and I have never bothered to make hollandaise if I didn't have lemons. I decided to give this one a go, as instead of lemons you reduce white wine vinegar by boiling it with peppercorns and bayleaves until it has reduced to a quarter of its original amount, intensifying it. You then proceed as you would with a normal hollandaise, mixing it with the egg yolks and adding the butter in slowly while mixing over a double boiler. It turned out well and I will definitely use it again (although I do definitely prefer the lemon version). 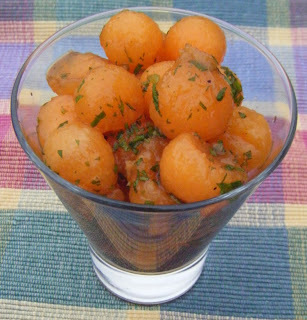 The rockmelon did get a little attention, my son decided he liked the idea of using the melon baller so we dressed them with some brown sugar, balsamic and mint and it was so sweet yet refreshing. Made me feel a little more virtuous after the other things I have been putting away! Lastly, while out and about I visited all the local berry farms as they are about to close for the season. They all do their own frozen berries up and they are cheaper and tastier than the ones generally available at the supermarket. 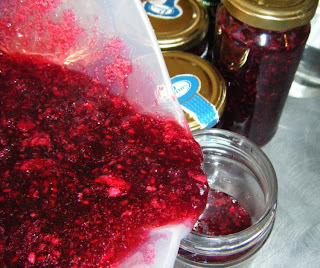 They are great for jam too, I made a few jars up with one lot of Tayberries which are I believe a cross between a blackberry and raspberry and make the most gorgeous tart jam. Of course I had to make some fresh bread rolls up to use up the last bits that weren't going to fill another jar! 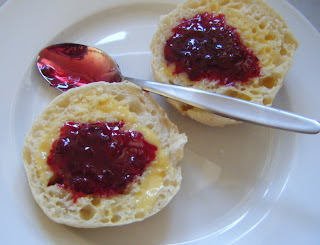 Was going to do a spiel on bread but this post is long enough so that will be told in the next instalment! Wow, you have been busy and everything looks very yummy. I prefer to make my own pesto too. I make up loads and then freeze it in ice cube trays that I then decant into a ziplock bag. Works well. Am really enjoying your blog. 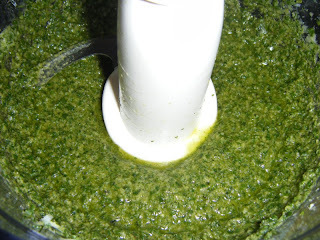 I adore home made pesto, such a summery taste! All your food looks fantastic. Homemade pesto is so yummy. 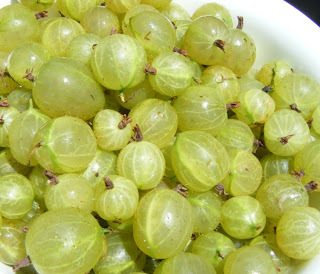 I love gooseberries. 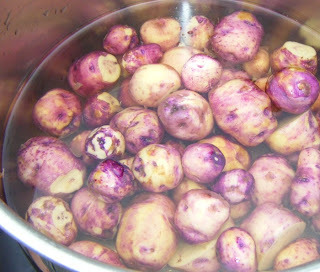 We grow them every year but can`t get a consistent good crop. Beautiful dishes. Linda, your food looks glorious!